Add a veil to create a pumpkin bride. Make bride and groom decorated pumpkins for a wedding using one of many methods available. The pumpkins are a great addition to a perfect Halloween wedding. Decorated wedding pumpkins are an excellent choice for weddings in October. Even couples who do not have an explicit Halloween theme and just a general autumn wedding theme can display a decorated pumpkin with pride. A number of methods are available for creating bride and groom decorated pumpkins. In fact, even couples without carving expertise can create a couple of jack-o-lanterns perfect for a wedding. Make sure the wedding photographer captures the pumpkin bride and groom, so that the decorations are preserved forever. Carved wedding pumpkins are an impressive sight at a wedding. Pumpkin carving kits to create silhouettes of a bride and groom are a great way to show off skills. Intricate designs often have the bride and groom in an embrace, usually with flourishes surrounding them. Some couples even have their own faces carved into the pumpkins. Couples who do not have the talent to do it themselves should contact local pumpkin farms to get recommendations to hire a professional carver to create the artwork for their wedding.Less difficult designs allow couples to make the carvings themselves. Consider carving a simple happy jack-o-lantern face into two pumpkins, then adding a purchased top hat and bow tie to one and a veil to another. Alternatively, carve the monogram or initials of the bride and groom into pumpkins. Remember that real wedding pumpkins need to be carved the day before or even the day of the wedding in order to keep them looking fresh. Instead of using real pumpkins, many craft stores carry faux pumpkins that are perfect for carving and can be kept as a keepsake after the wedding. Use battery-operated lights and not candles inside them. Paint the entire pumpkin white or black, and then paint a bride and groom silhouette in the opposite color. Paint a favorite engagement photo onto the pumpkin. 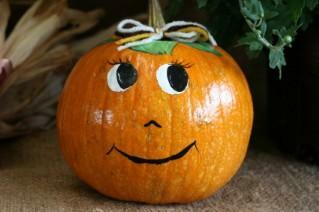 Paint cute character faces onto the pumpkin and adorn them with a veil and bowtie. Paint wedding clipart onto a pumpkin that represents the bride and groom, such as a pair of wedding bells or doves. Practice painting on a pumpkin before doing the actual pumpkins for the wedding. The bumpy, ridged surface is very different from canvas or paper. Bride and groom decorated pumpkins are an excellent centerpiece or decoration at a Halloween themed bridal shower. Use faux pumpkins if they are carved and give them to the bride to use as part of her Halloween wedding decorations after the shower is over. At a wedding ceremony, display the painted pumpkins on the steps leading into the ceremony site or on the guest book table. They can also be placed on small pillars near the doors or even on top of hay bales. After the ceremony, move the pumpkins to the reception. There, they can be placed on the cake table or used as part of the head table decorations. Add miniature pumpkins to guest tables with a veil and bowtie as part of the centerpieces. Outdoor Halloween wedding receptions allow couples to get creative when displaying their bride and groom decorated pumpkins. Stack several large pumpkins atop one another, similar to the construction of a snowman. Place a decorated bride pumpkin head and decorated groom pumpkin head on top of two different stacks to create life-size pumpkin newlyweds. Pumpkins decorated to look like a bride and groom are quirky and fun Halloween and fall wedding decorations. The pumpkins will add a festive touch to an October wedding celebration.